The bad news: So far this weekend, airlines have grounded an estimated 2,200 flights because of the inclement wintry weather sweeping the country. The good news: Things may be looking up for travelers on Sunday. While an estimated 1,600 flights were cancelled on Saturday and another 3,440 were delayed, Sunday saw those figures cut in half. Seems, like the weather is getting better, right? As of 10 a.m. EST on Sunday, 668 flights were cancelled and 1,103 flights were delayed, according to Flight Aware. 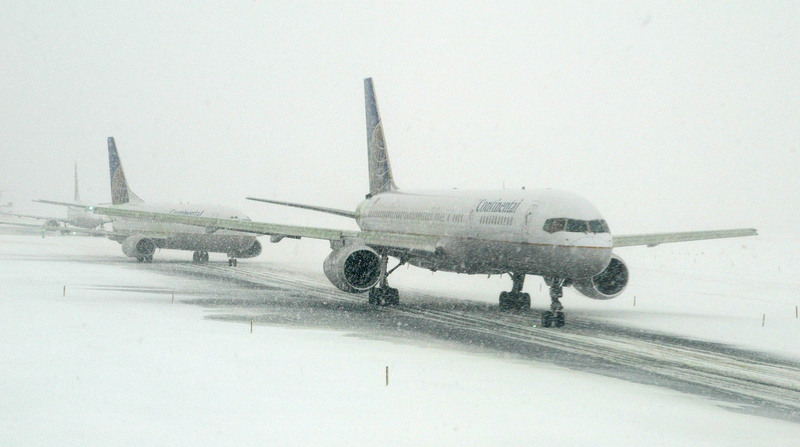 The majority of Sunday’s cancelled and delayed flights were going in and out of Philadelphia and Denver, both of which experienced wintry weather late into Saturday evening. Washington, D.C., Baltimore, and New York airports also experienced lingering delays and cancellations on Sunday, though they’re expected to ease up as the day goes on. This weekend’s storm wreaked havoc on the East Coast, reaching as far south as northern Georgia. Baltimore saw about eight inches, while Washington, D.C. got about five inches, and New York City got two. Boston once again got piled on this weekend, with an additional three to six inches blanketing the eight feet of snow already on the ground. Fortunately, Sunday’s improved travel conditions accompany a brief reprieve from the arctic weather that’s taken the U.S. by storm this month. In the Northeast, which has seen a particularly harsh winter, temperatures are expected to rise above freezing on Sunday. TIME reports that temperatures might reach the mid-30s in Boston and Portland, Maine, 42 in Philadelphia, and 35 in New York City. But don’t get too excited about the prospect of warmer temperatures, Northeasterners. Temperatures will drop right back down to this month’s above-average lows as early as Monday. However, as brutal as this winter might seem right now, statistically speaking, it hasn’t been all that rough of a winter. Although this month has been bone-chillingly cold, and the Northeast has seen an astounding amount of snow in the period of just a few weeks, the National Climactic Data Center (NCDC) reports that, on the whole, this winter has been surprisingly warm. That’s because while February has been unusually chilly, the beginning of the winter was unusually warm. According to NCDC, an estimated 3,500 records were set for daily high temperatures across the U.S. in January. Globally, this January was the second warmest on record. So, when you’re bursting with frustration over messed up travel plans and feeling like you might never thaw out, realize that it could always be worse. There’s a light at the end of the tundra.